I signed up for Virgin Mobile today, as the answer to my “I’m on the road, and I’m tired of trying to find wifi hotspots”. Previously I’d had a Sierra Wireless AirCard (595U) with Sprint, and it worked great, but I couldn’t justify $60/month for the occasionally trip to the Bay area. 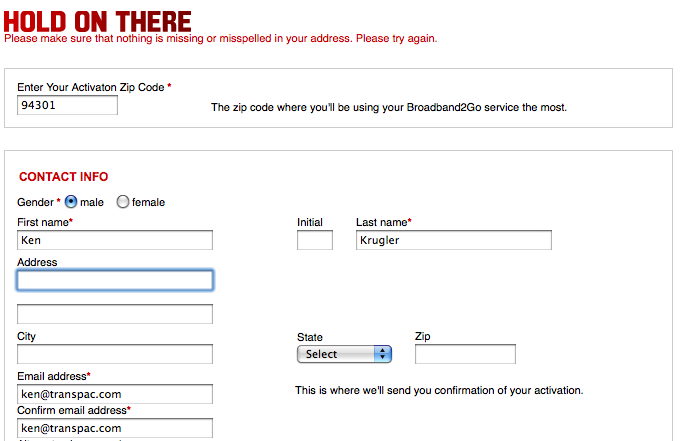 This is the error screen you get when you don’t fill in the address fields. Which aren’t marked as being required. But after using their Broadband2Go app, I can see that having a polished UI experience isn’t high on their priority list. I’m just hoping the Sprint-provided service works as well as with my old WiMax setup. You are currently browsing the Ken's Techno Tidbits blog archives for July, 2010.